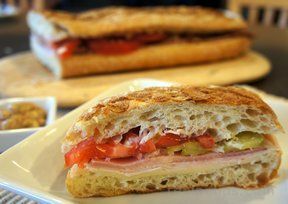 A traditional small Italian sandwich that is pressed and grilled so that the bread has a golden, grilled crust on both sides of the sandwich while the fillings inside are compressed together. Typically, the sandwich is filled with a variety of ingredients such as meats, cheeses, roasted bell peppers, roasted egg plant, sweet basil, sun-dried tomatoes, and other similar sandwich fillings. Most often made with a Panini Press, also referred to as a Panini Maker, a Panini Grill Press, or simply a Panini Grill, the sandwich maker contains top and bottom ridged heat plates that press and grill the bread in one operation. This feature produces a golden, crispy crust on both sides of the sandwich without requiring the sandwich be flipped to grill the other side. As the weight of the grill presses down on the sandwich, the inside fillings and the crust are compressed as is the crust into a compact sandwich.